Posted on December 9, 2013	by Smiling Road Warriors! 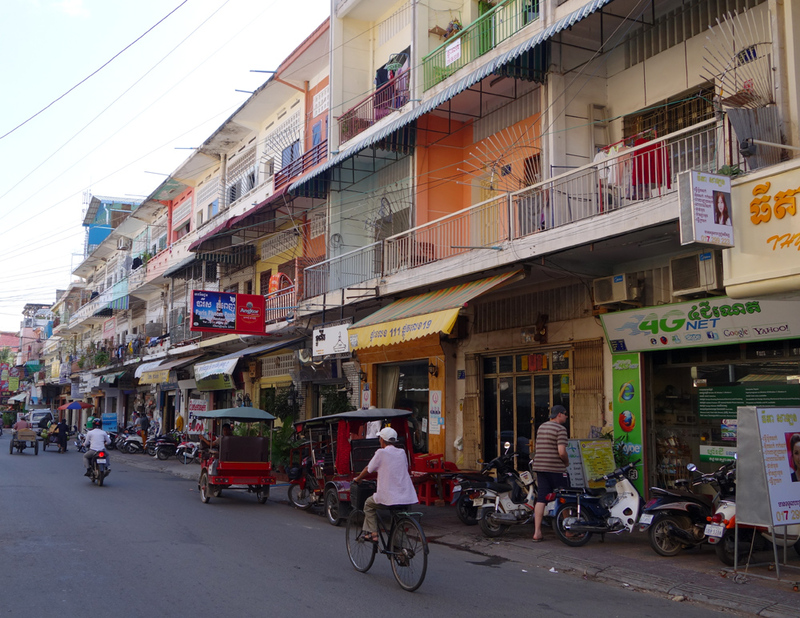 Today we took a short 45 minute flight from Siem Reap to Phnom Penh, and spent the afternoon there to explore the town on foot. We walked around the French Quarters of the old town and found a place for lunch; sat under some trees and watched the stream of life parade by our vantage point. 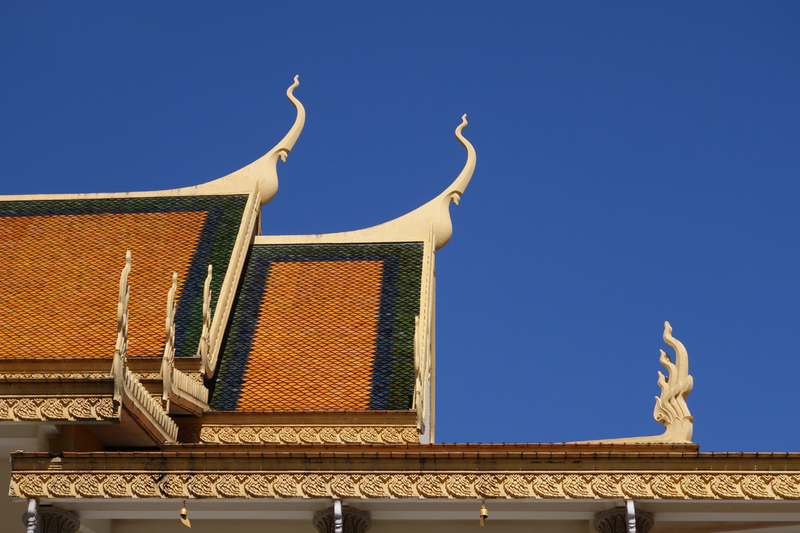 Of course Phnom Penh is the capital and the largest city in Cambodia, with a population of around 1.5 million and growing. With life still difficult in the rural areas, large numbers make the move to this city looking for work every year. 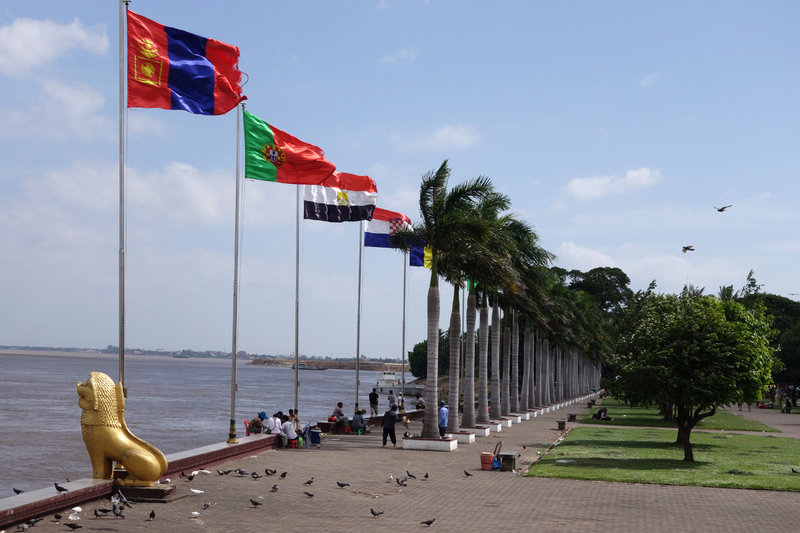 It sits at the confluence of the Tonlé Sap and Mekong River. What a beautiful waterfront setting. Traffic is congested with increasing numbers of autos owned by a growing middle class. Most people ride motorcycles or scooters, with some bicycles sharing the road as well. It continues to amaze us how the cars, trucks, motorcycles,and tuk-tuks can all merge together into a (mostly!) unified flow of traffic. I think one thing that makes it work as well as it does is the fact that no one drives fast here, except for the occasional speed-demon, and everyone is thus able to anticipate each other’s move into and out of the stream of traffic. Our second day here was hard for both of us. 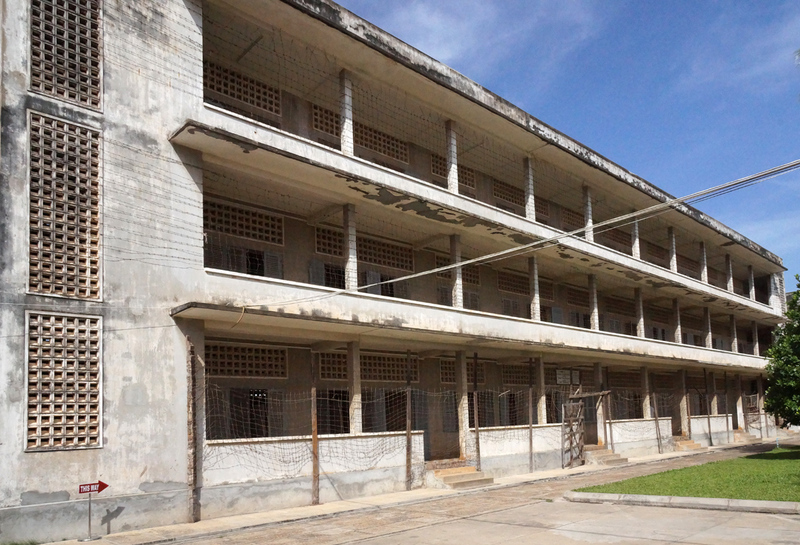 It was both sobering and difficult to visit the Toul Sleng Prison Museum and the site of the most famous ‘Killing Fields’. But this was something that we needed to witness, because of our close association with Cambodian Refugees after the fall of Phnom Penh in 1975. We are including only a few of the many images we took, leaving the most difficult ones out. They are not easy viewing. If anyone has an interest in the story, we can share when we return to Portland. 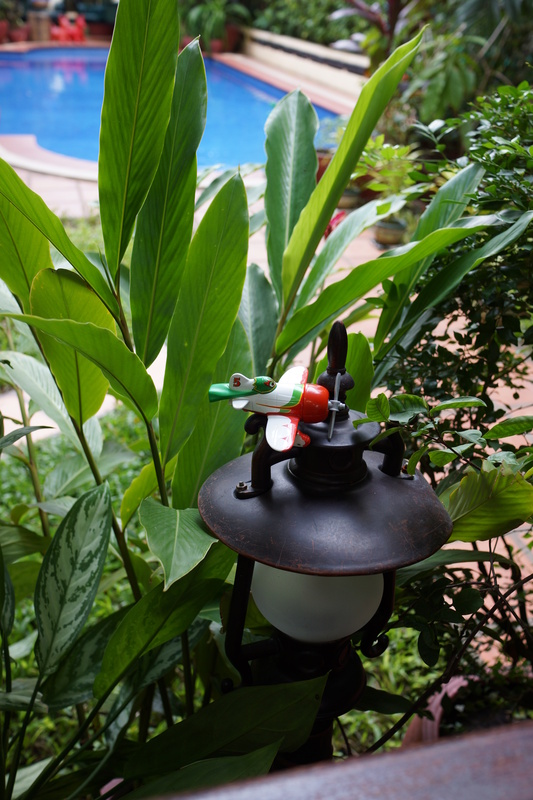 . .
A little personal background: we had a Cambodian father and son live with us for six month after they escaped to Thailand. 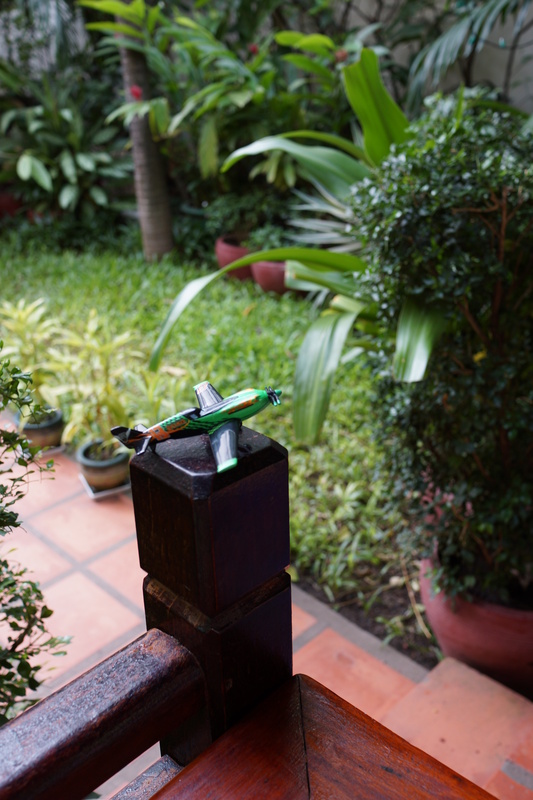 They were on their way to Bangkok as Phnom Penh fell in 1975. We worked with our community at that time, in Salem, Oregon to help bring over approximately 80 more Cambodian Refugees to our area. 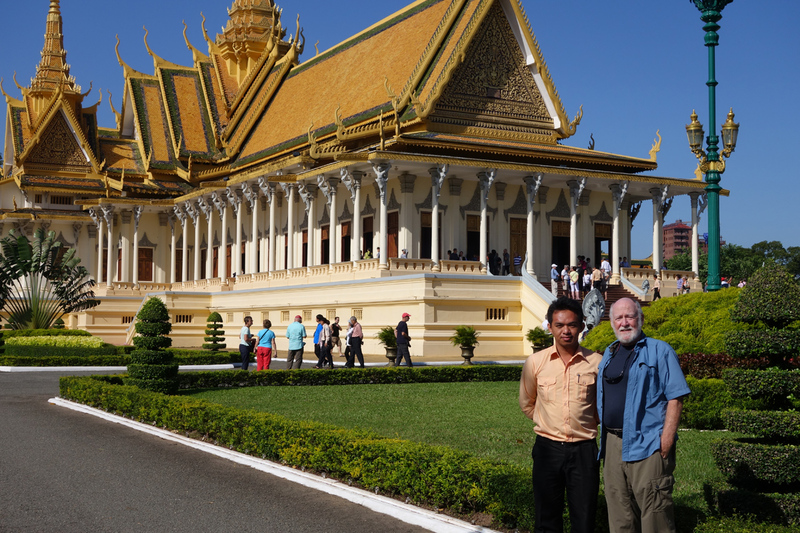 We listened to their stories of the miserable conditions and hardships they experienced in Cambodia after the Khmer Rouge take-over, and the fear they had for family members left behind. These memories still haunt us. As we walked the infamous Toul Sleng Prison (a former high school), it was very difficult to view and visualize conditions of the prisoners during these horrific years My thoughts went back to what would have happened to Sreng (the father who stayed with us) if he had not escaped, as he was one of the “educated ones”, and had also worked with the Americans in Cambodia. My thoughts also went back to what we knew about his wife and children, and what they went through to stay alive during that time. It is hard to imagine how the soldiers/people could be so cruel to their own people and sometimes their own parents. 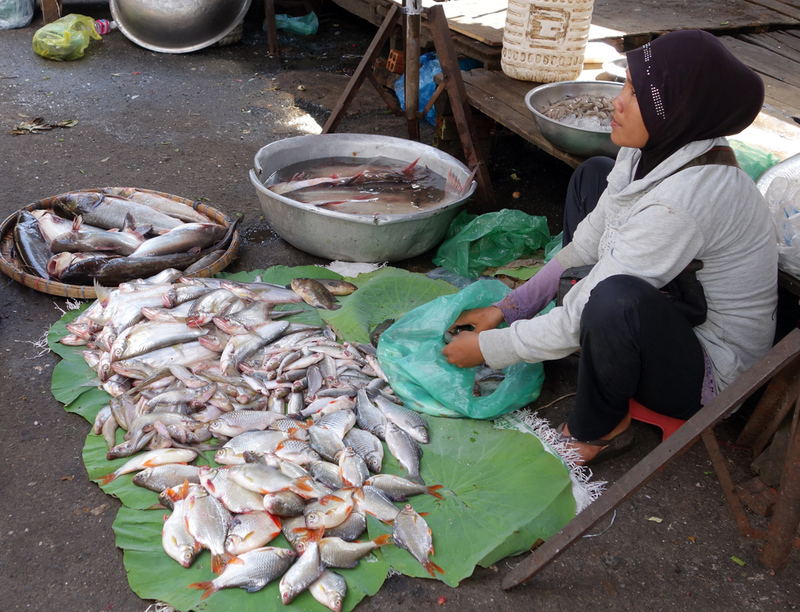 The Cambodian people we have met throughout this journey have such a kind and friendly manner. We learned that the Khmer Rouge had evacuated everyone in Phnom Penh in a matter of days after solidifying their power in the country. They had convinced the entirre population of the city that they needed to get out now, as the Americans were going to bomb the city and that they could come back in 3 days. Of course, they never were allowed to return: they but were all sent to the country to work in rice fields and given very little to eat. Or killed . 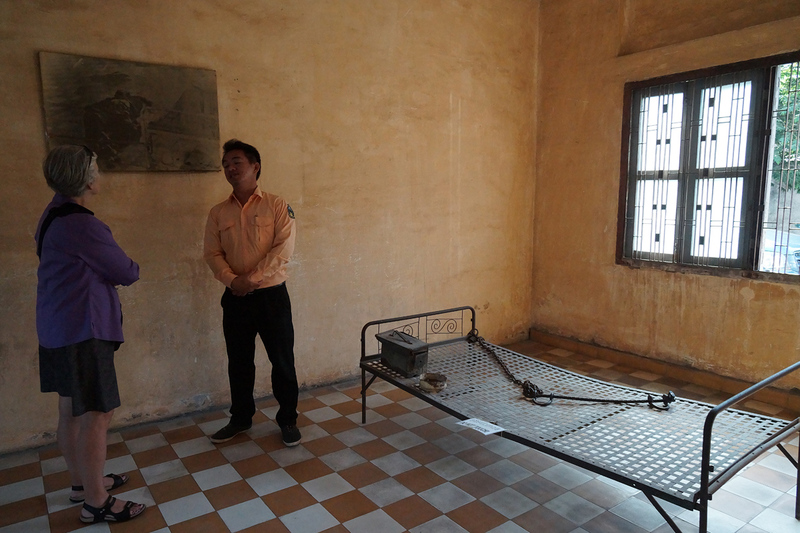 . .
Prison the Khmer Rouge used to interrogate prisoners before torturing and killing them. a large cell for ‘more important’ prisoners. small cells, only a few meters wide. 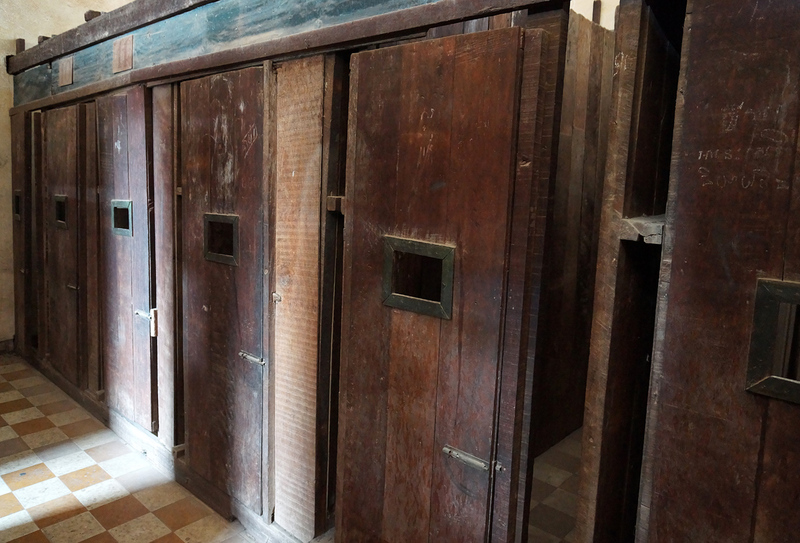 There were only 7 prisoners alive in here when the Khmer Rouge were finally thrown out of the country by the Vietnamese army. Just Seven! 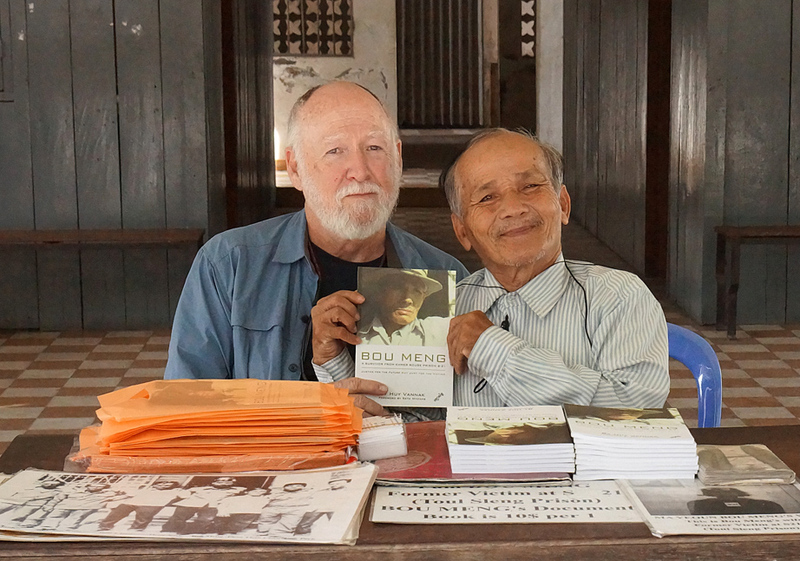 Two of them are still living and recently written small books about their experiences. We now have read them both. This man is the same age as Gary. He took great delight in Gary’s questions, and similar age! 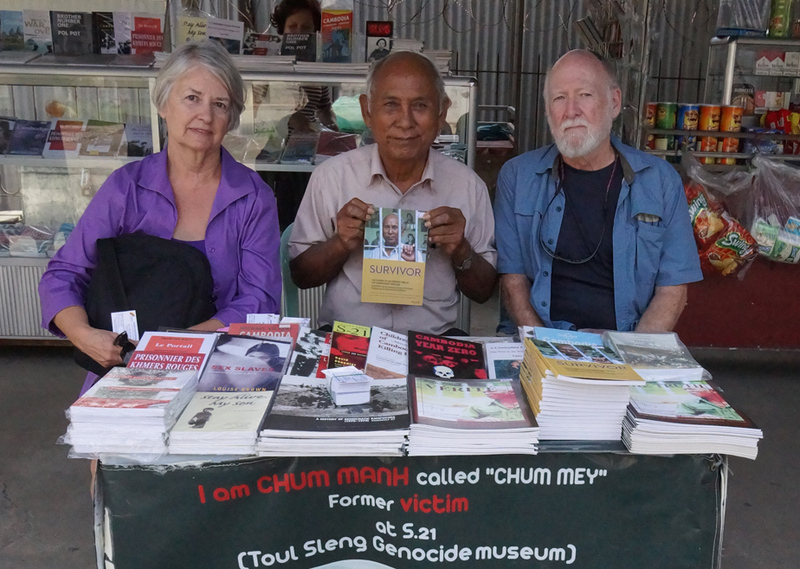 Through a granddaughter, Gary told Bou Meng about the Cambodan refugees we had assisted. He was touched and said “thank you”. Of course, we bought both these men’s books. Our guide said Bou Meng is not in as good health and can only come 1 or 2 times a week to the site. The Memorial Stupa built at the site of the Killing Fields. . . 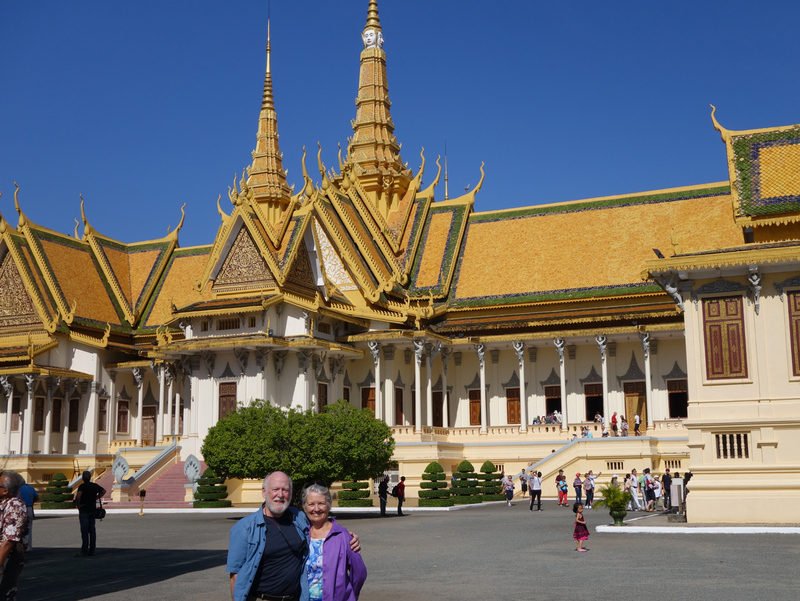 The Royal Palace of Cambodia, in contrast, is strikingly beautiful, and near the waterfront. 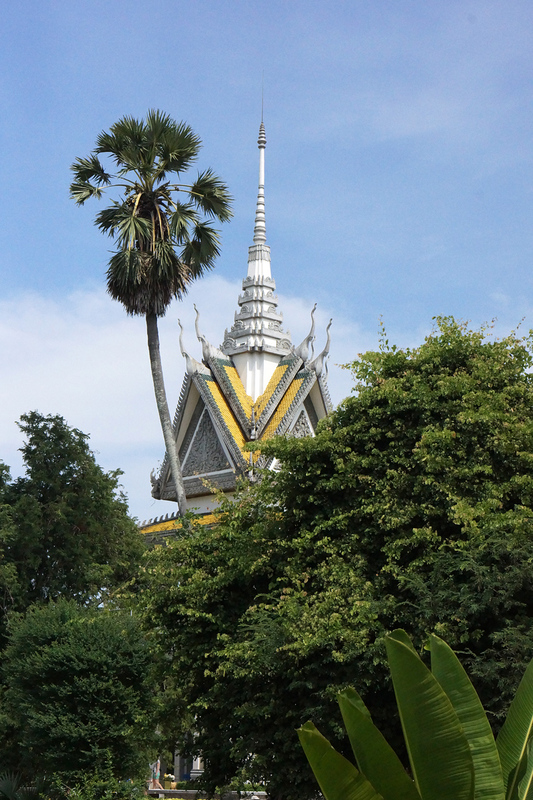 It was built in 1866 by King Norodom and is still home to the current King and Queen of Cambodia. We also visited the National Museum, that had many pre-Angkorean pieces, as well as some from the early temples. 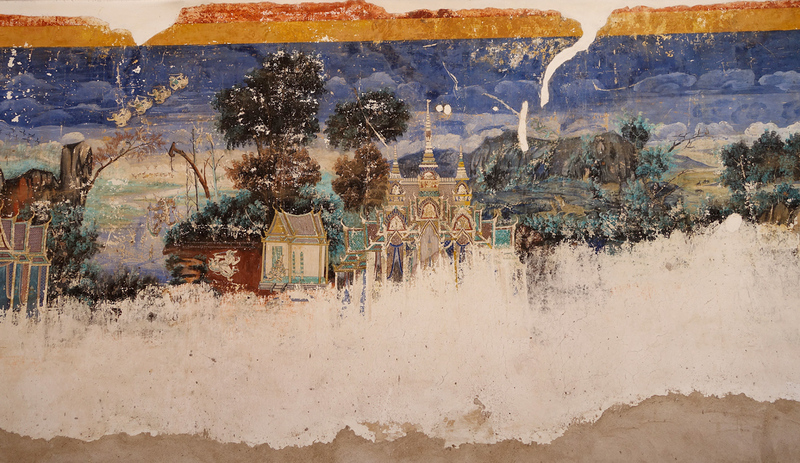 Hindu stories on the walls from an early period of the palace complex — the lower part ruined from weather and a very poor attempt to restore it 50 years ago. 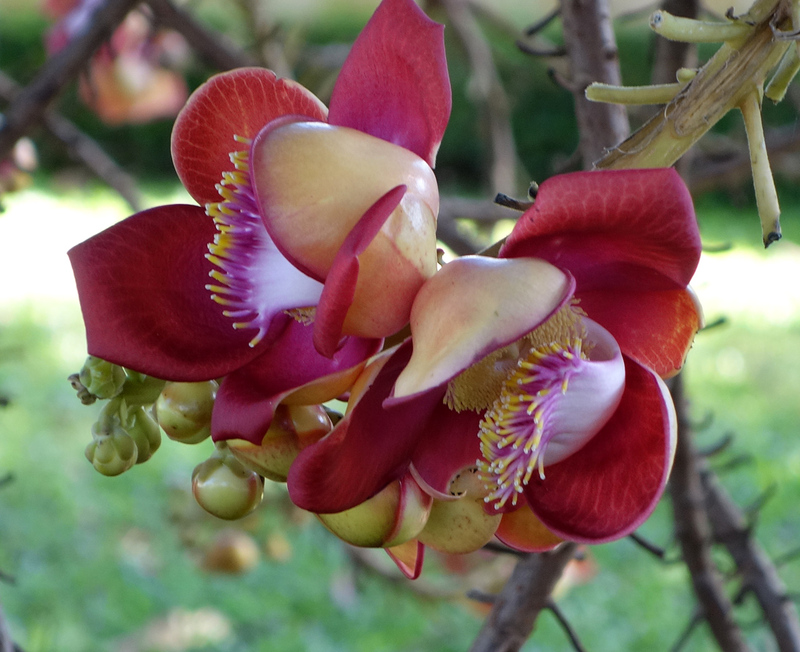 Beautiful flowers that grow on the Buddha Tree. This is a most revered tree in the country. 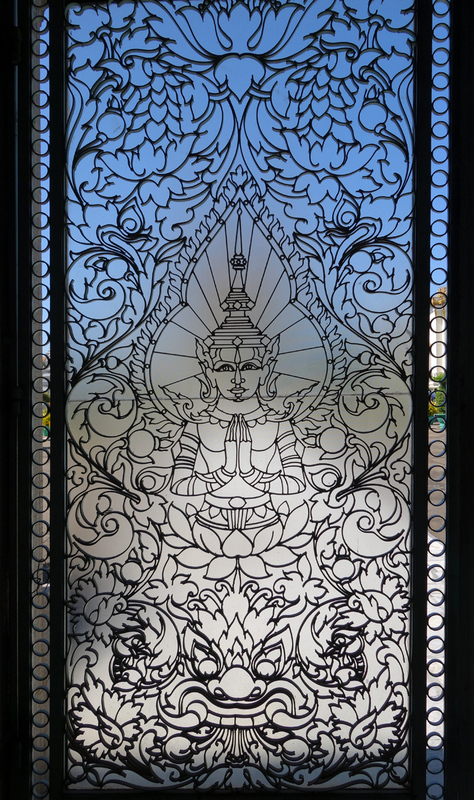 An iron gate with Buddha sculpture. The French penchant for wrought iron is seen all around, even here at the Palace. 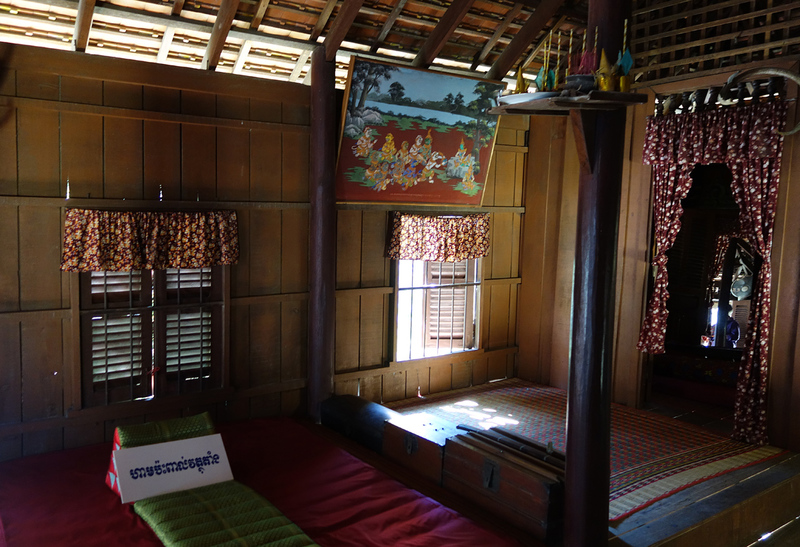 Upper floor of typical home on silts. On display in the Palace grounds. 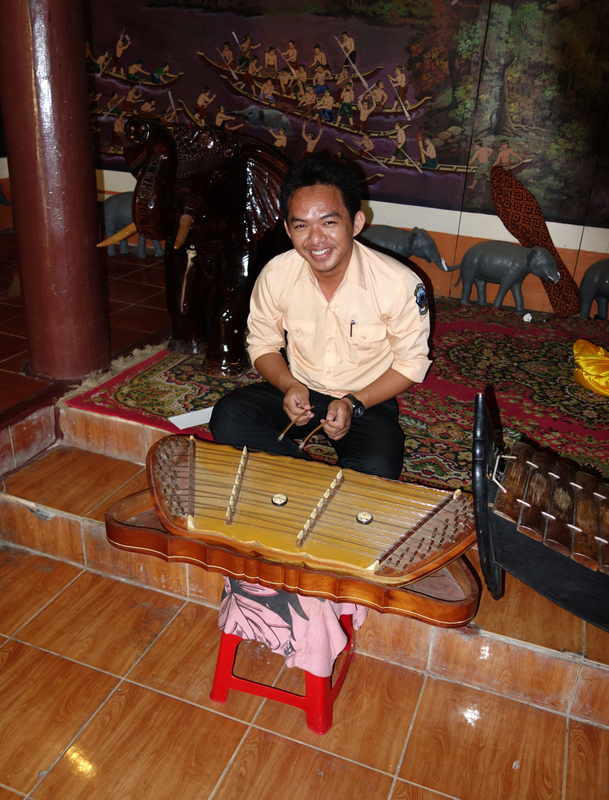 Our guide playing traditional instrument. 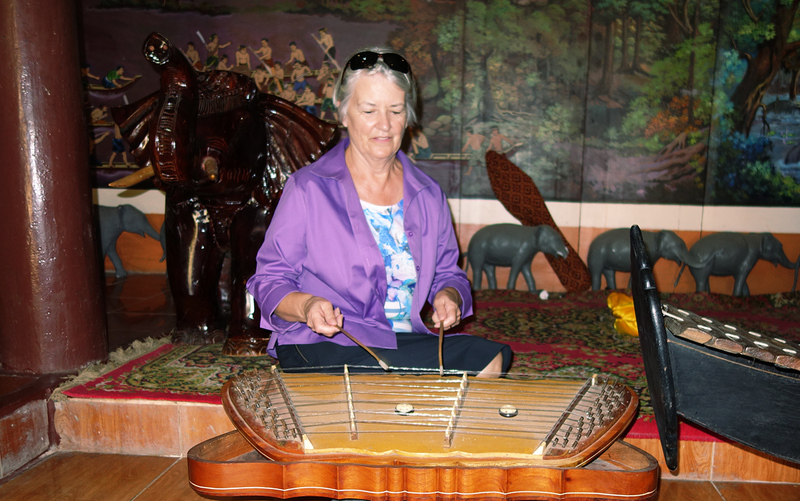 Sounded much like a zither. The first day we had lunch at a restaurant called “Romdeng ” which works with former street children and marginalized young people in Phnom Penn. The next day we had lunch at the “Friends – The Restaurant”, which was also started by Friends, an international NGO. Both these training restaurants are now run by a Cambodian NGO to train former street children, along with providing them housing, medical care, and social skills. Other projects are designed to assist the children’s social reintegration ( into their families, the public school system, employment, and their general culture). It is a large scale operation, whereas the restaurant we frequented in Siem Reap is similar,it is for older youth and a smaller operation that trains only 5-7 students a year. 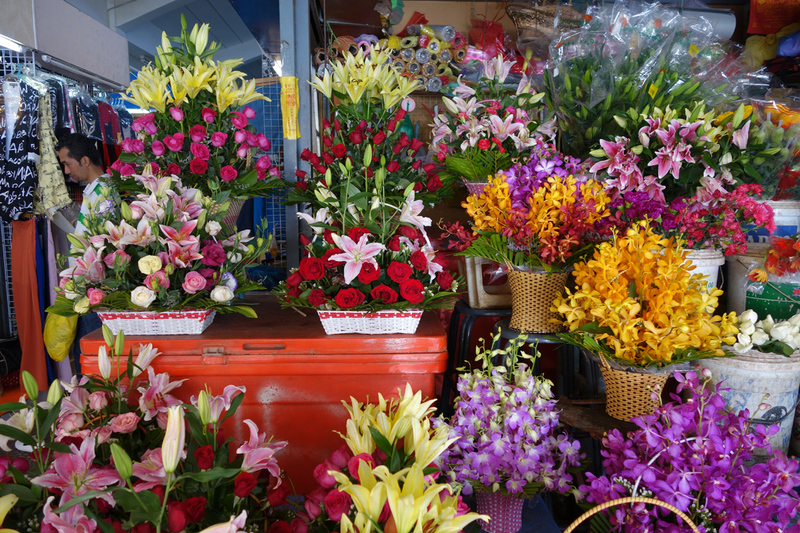 The large Central Market is reported to be the ‘biggest domed-market in the world’. 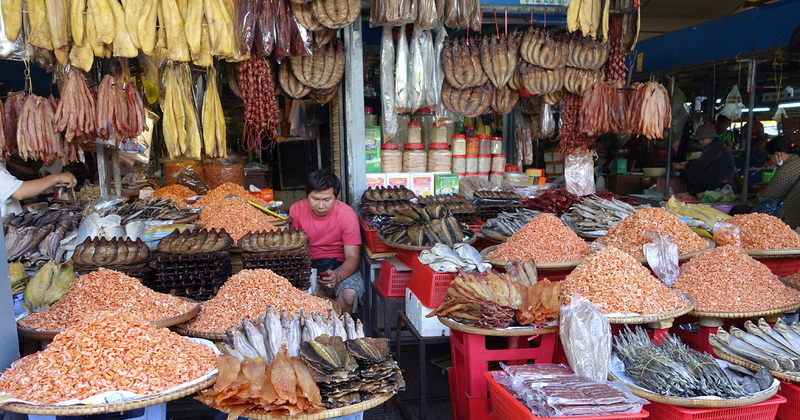 Maybe… Its Khmer name, Psar Thmay, translates as “new market”. 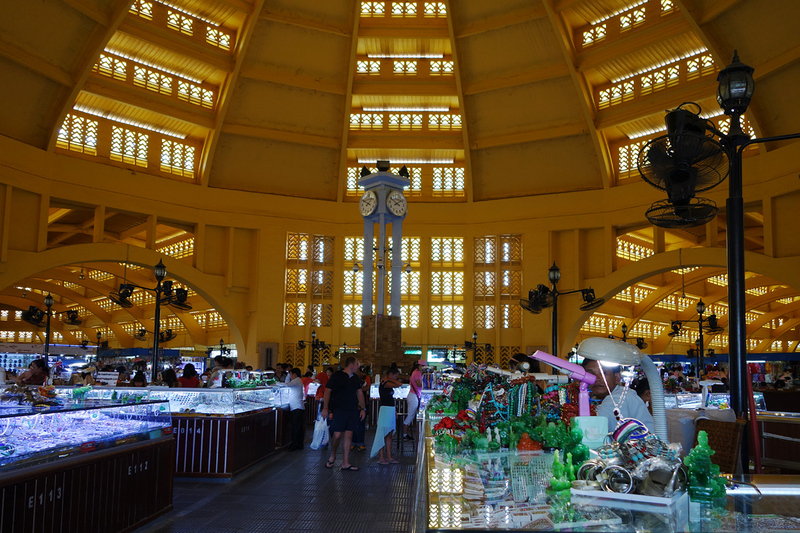 It was built in 1937 during the French colonial period, in an Art Deco style, and is painted bright yellow. It consists of four wings dominated by a central dome. 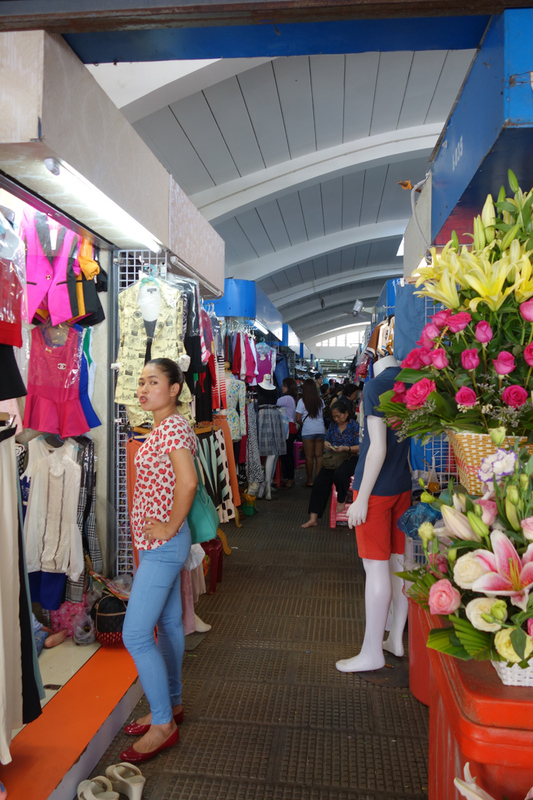 Under the dome is all this jewelry, and within the four wings and around the compound outside, they sell almost anything you can think of, including electronic equipment, clothing, watches, bags, dried and fresh foodstuff, and oodles of street vendors for meals. 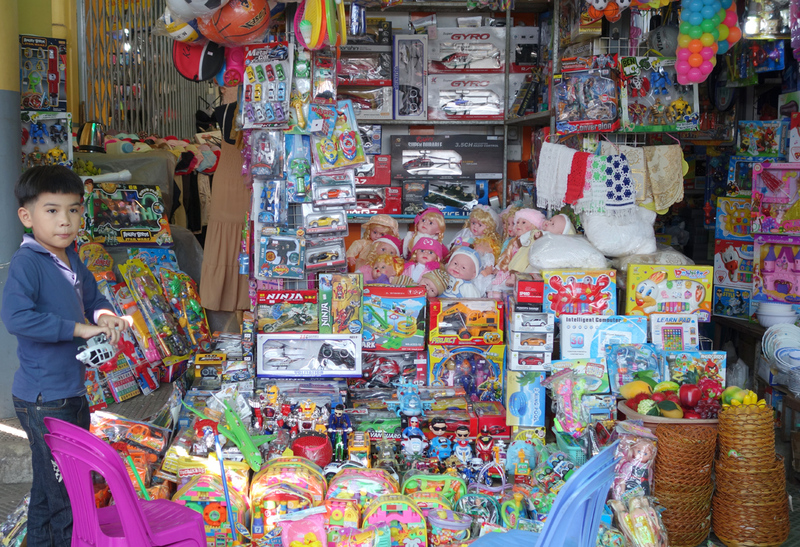 Much of the merchandise consists of ‘knock-offs’ and grey-market materials, but some are actually of good quality. 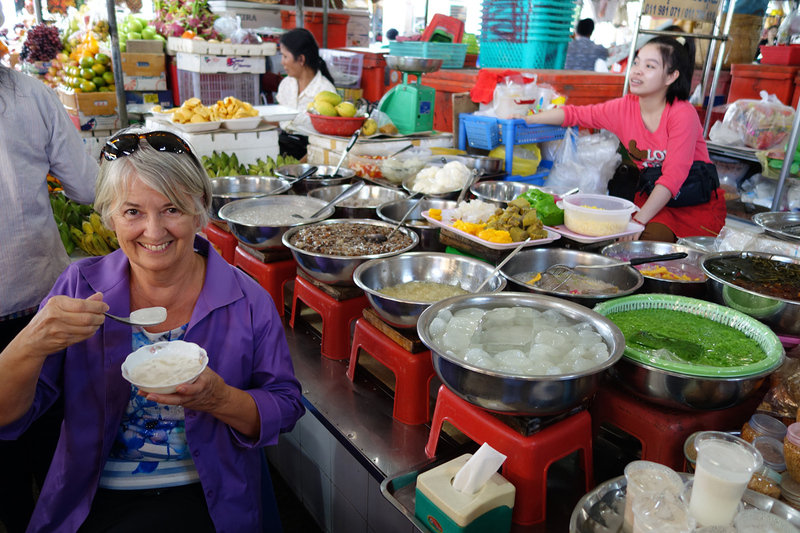 Trying a popular sweet — mangosteen, coconut milk, and sugar. Tasty! Another beautiful day trip enjoyed by your recliner chair traveler.